We first visited Shine Cafe’s Fort Street location and quite enjoyed our breakfasts, so we thought we’d give their downtown Victoria location a try. 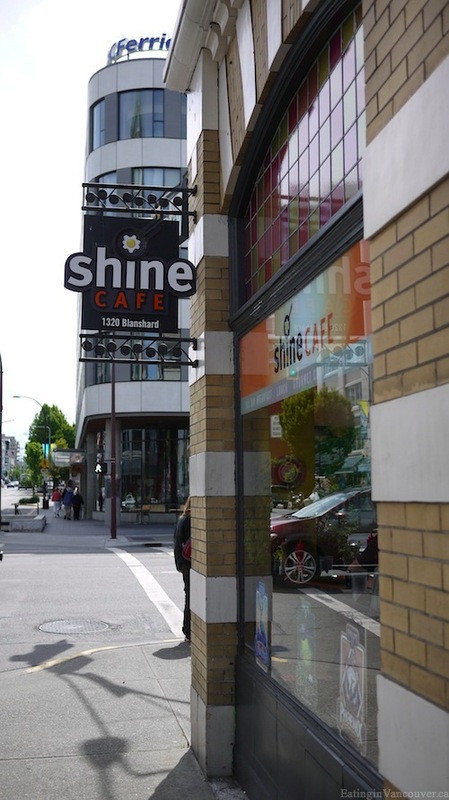 Located in the previous home of Demitasse Cafe, right on the corner of Blanshard Street and Johnson Street, Shine Cafe is a family owned all-day breakfast restaurant serving a good variety of items. Quality, local ingredients are important to Shine Cafe. All of their meats are sourced as close as possible and are hormone and antibiotic free. Their (excellent) coffee is roasted and delivered fresh from local company Caffe Fantastico. And their tea is organic and fair trade from Victoria’s best tea purveyor, Silk Road. 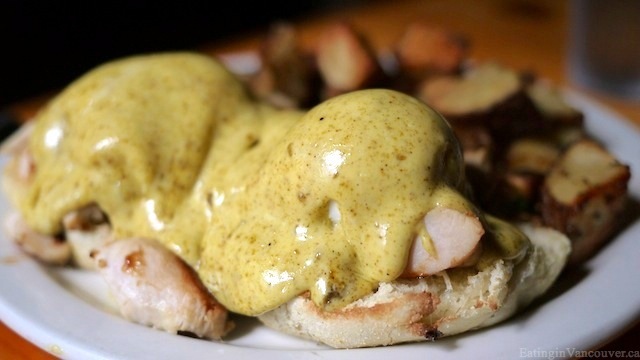 Eggs Benedict ($12.95) – This was a special of the day and it included a toasted English muffin topped with pieces of tender chicken breast meat smothered with a generous amount of flavourful curry hollandaise sauce, and served with oven roasted hash browns. Shine ($8.95) – Two eggs any style, two pieces of crispy bacon, sliced ham or savory sausage, and a choice of two different sides. 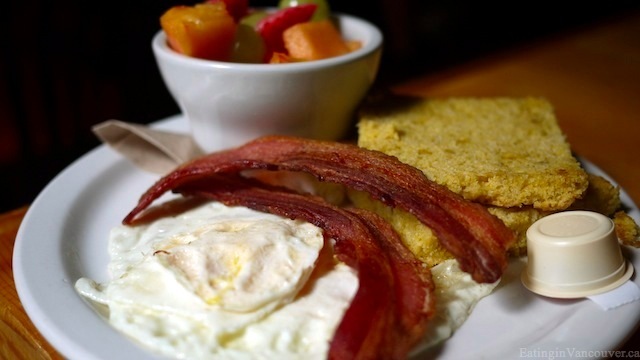 Plenty of side options are offered to please most tastes – oven roasted hash browns, Scottish potato scone, fresh fruit cup, sourdough or multigrain toast, housemade cornbread, and a grilled tomato. Since I’m a huge fan of cornbread, I just had to ordered some. And to add some antioxidants to my plate, I opted for the fruit salad. The only problem was the fruit cup they served me contained old and mushy strawberries, grapes, and cantaloupe. I brought this matter to the attention of our server and she quickly remedied the situation by promptly providing me with another, fresher fruit cup. 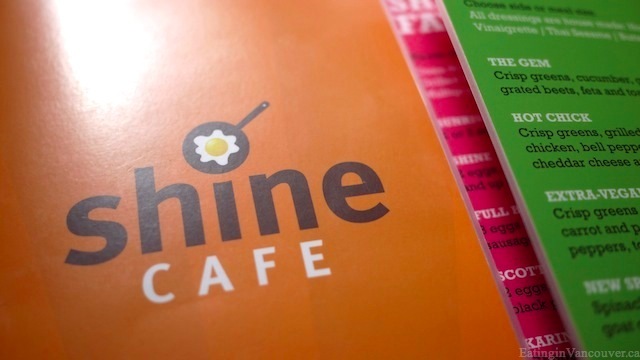 Overall, Shine Cafe provided great service and large portions of tasty dishes. Both locations are worth a visit, especially if you’re like us and appreciate all-day breakfast joints.